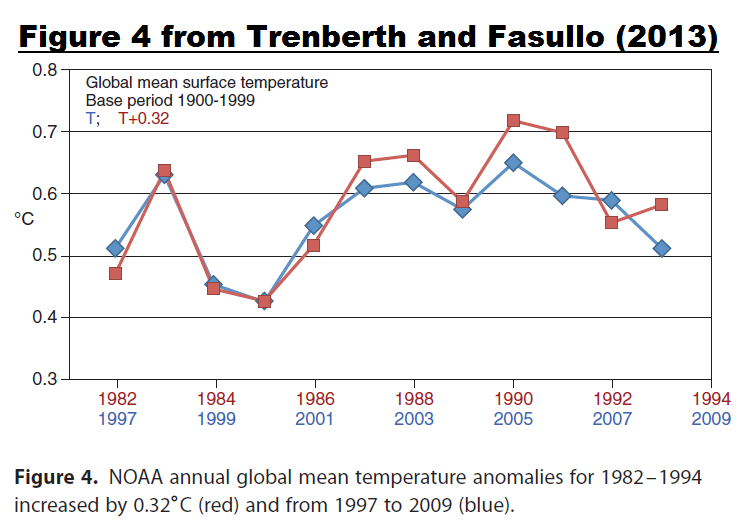 We discussed the Trenberth and Fasullo (2013) paper “An Apparent Hiatus in Global Warming?” in the recent post Trenberth and Fasullo Try to Keep the Fantasy Alive. Since then, Dana Nuccitelli published a post at TheGuardian—cross posted at SkepticalScience—extolling the greatness of Trenberth and Fasullo (2013). So far, the team at RealClimate and Joe Romm at ClimateProgress have been silent about the paper. Give them time. The following are a few more comments about Trenberth and Fasullo (2013). Even in the last three decades we can ask whether such slowdowns have occurred before, and Figure 4 shows the 11 years beginning 1982 and 1997 in detail, showing a remarkable resemblance in subsequent evolution. But as we can see in Figure 1, there was little to no slowdown in the warming rate for the period of 1982-1993, using the same global surface temperature anomaly dataset presented by Trenberth and Fasullo (2013). 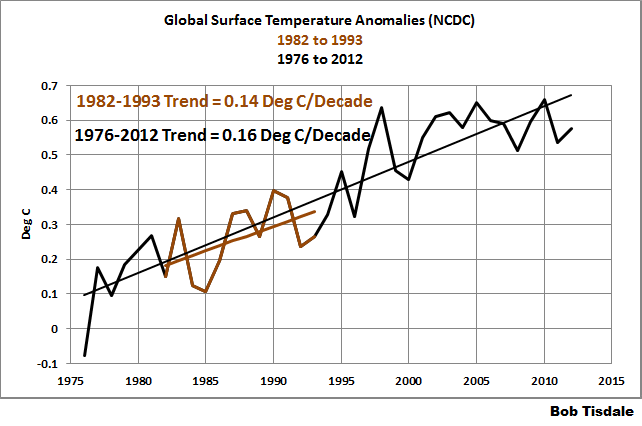 The warming rate is comparable to the trend from 1982 to 2012, “the last three decades”. 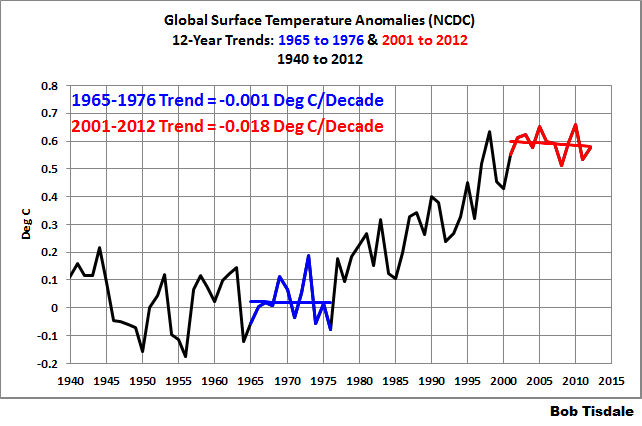 Figure 2 presents the 12-year running trends for the NCDC global temperature anomalies. As you’ll note in Figure 2, the y-axis is scaled in deg C/decade. The final point shows the linear trend for the 12-year period of 2001 to 2012, and the data point before it shows the trend for 2000 to 2011, etc., traveling back in time. The first data point shows the trend for the 12-year period of 1880 to 1891. There are no 12-year periods with trends comparable to the period of 2001-2012 until we travel back to the period of 1965-1976. 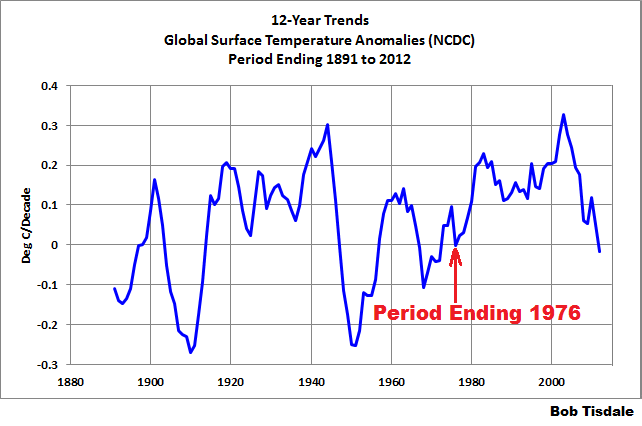 For those who would prefer to see those two periods compared in a time-series graph of global surface temperature anomalies, refer to Figure 3. So the answer is NO to Trenberth and Fasullo’s question of “Even in the last three decades we can ask whether such slowdowns have occurred before”, using 12-year periods as they elected to present. One approach to estimating ocean heat content (OHC) changes is by combining the available observations (surface, ocean, and from space) with an ocean model to produce a dynamically consistent ocean analysis. The new ORAS-4 ocean reanalysis from ECMWF has revealed very distinctive climate signatures that are realistic in magnitude and duration in terms of changes in OHC [Balmaseda et al., 2013] (Trenberth et al., submitted manuscript, 2013). 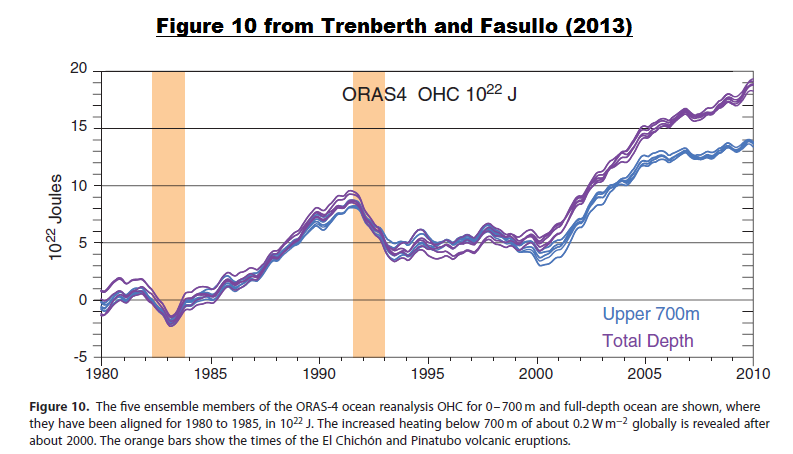 Figure 10 shows the five ensemble members of the ORAS-4 ocean reanalysis OHC for 0–700m and full-depth ocean and reveals the increased heating below 700m depth of 0.21Wm−2 globally after 2000. The orange bars show the times of the El Chichón and Pinatubo volcanic eruptions when sharp drops occurred in OHC that quantitatively match estimates of TOA radiative changes (such as in Pinatubo) [Trenberth and Dai, 2007], as demonstrated in a new analysis by Trenberth et al. (submitted manuscript, 2013). The orange bars show the times of the El Chichón and Pinatubo volcanic eruptions. Unfortunately for Trenberth and Fasullo (2013), the dips from those volcanic eruptions don’t appear in the NODC (Levitus et al) ocean heat content data. 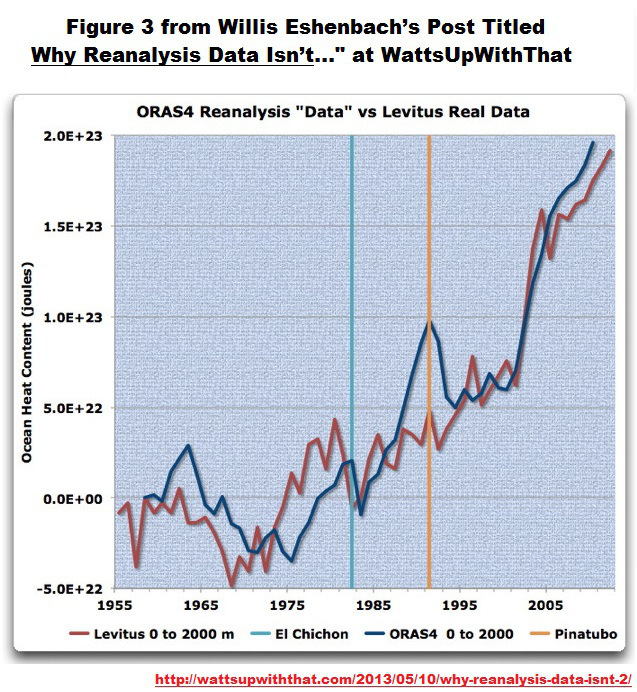 Willis Eschenbach compared the ORAS4 ocean heat content reanalysis to the NODC data in Figure 3 from his post Why Reanalysis Data Isn’t… at WattsUpWithThat. See my Figure 5. In Figure 3 [my Figure 5], the shortcomings of the reanalysis model results are laid bare. The computer model predicts a large drop in OHC from the volcanoes … which obviously didn’t happen. But instead of building on that reality of no OHC change after the eruptions, the reanalysis model has simply warped the real data so that it can show the putative drop after the eruptions. Willis has also identified the timing of the eruptions of El Chichon and Mount Pinatubo. As you can see, the NODC’s ocean heat data does not include the major volcanic dips and rebounds shown in the ORAS4 reanalysis used by Balmaseda et al (2013). In fact, the NODC global ocean heat content data rises, not falls, immediately after the eruption of El Chichon in 1982. And the drop in the NODC data after the eruption of Mount Pinatubo is similar in magnitude to all of the other annual variations. Note also that the reanalysis used in Balmaseda et al also had a period of extreme warming from the early 1980s to 1990 that does not exist in the data. It appears that sharp rise was needed to accommodate the dip and rebound in the reanalysis caused by the eruption of Mount Pinatubo—a dip and rebound that is unobserved in the data. Bottom line: Trenberth and Fasullo (2013) presented a reanalysis of ocean heat content that met how they expected the oceans to respond to volcanic aerosol forcings. They did not present data that shows how the ocean heat actually failed to respond to those volcanoes. Some might think the absence of responses to volcanic aerosols is an indication the oceans are not sensitive to changes in climate forcings. Now consider that volcanic aerosols impact sunlight and that sunlight penetrates the oceans to depths of about 100 meters, with most of it being absorbed in the top ten meters. And consider that infrared radiation from manmade greenhouse gases can only penetrate the top few millimeters of the ocean surface. It’s no wonder Trenberth and Fasullo are trying to show some type of response to climate forcings with their use of the ORAS4 reanalysis. This entry was posted in CAGW Proponent Arguments, Ocean Heat Content Problems, The Halt In Global Warming. Bookmark the permalink.